Have you ever had plantains or Plátanos (in Spanish)? When unripe, they look like big green bananas and when ripe, they are very yellow with some black spots. You’ll see them in most supermarkets or at Latin American grocery stores. Wholesale Clubs like Costco and Sam’s Club sell them too. Plantains may look intimidating but they are low in carbs and high in fiber so when used to make “Twice Fried Plantains – Tostones” (in some Latin American countries, like Puerto Rico, “s” is silent so it’s pronounced as “Totone”) they make a perfect side dish. When they are ripe, they are much sweeter and are used in making Maduros which are similar to fried bananas, and are like a dessert. Plátanos have been Latin Americans’ traditional ingredient for centuries, making them a true Paleo ingredient so, no wonder Paleo cooks love using them. Plátanos are great in stews and are best known for making “Tostones” but I don’t make them as often as my family would like because, as low in the carbs as they are, my tribe would eat them up as soon as they are out of the pan. These are that good. I don’t want to be blamed for making my family fat or constipated from too much fiber! So don’t say I didn’t warn you. It’s hard to just have one as my family will tell you. I spent my formidable years in the Bronx, NY, helping my family’s retail business. Our main clientele was Latin Americans. I had the pleasure of eating all kinds of Latin American food and undoubtedly, they were always accompanied with Tostones as a side dish. They are hot, salty, soft on the inside and crunchy on the outside. Sometimes I would get full just munching on Tostones even before I got to the main meal. And that’s because they are the best when piping hot so I would eat them while they were still sizzling from frying. So I HIGHLY recommend serving them piping sizzling hot as they are not as good when cold. The reason why they are ‘twice fried’ is to fry them first to flatten them out and then fry again to make the inside soft and outside crunchy. Why not make thinner cuts so you don’t have to flatten them? That’s because they’ll end up hard, like Plantain Chips. My tips on frying. Tostones absorb a quite bit of oil when frying. But if you’re using a good oil like avocado oil, you’re getting good fat so who cares? It’s a bonus! So make sure to add more oil when frying the second time. Since you’re using good fat/high heat point oil like avocado or coconut oil, you don’t have to worry about burning them either. Want more flavor? Use either lard or bacon grease. Yum! For my taste, I like to add minced garlic, coarse sea salt, and cilantro when they come out of the pan while the oil is still hot. 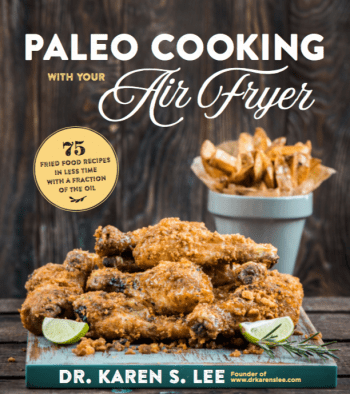 This time, I used my air fryer to “fry” them and I LOVED it since there was no splatter of oil everywhere. I’ll tell you more about my air fryer in a later post. One more tip when making Tostones. Use a meat tenderizing mallet on a good sturdy table – not the cutting board – to flatten them. Place a large parchment paper, place the half cooked plantain disks on one side. I put all of them from one banana next to each other on one side of the paper. Fold the parchment paper over all of them. Take the mallet and flatten them out one at a time, being careful they don’t fly out of the paper. It’s a great way to take your stress out!! 🙂 Or you could use a Tostones Press like this from Amazon (Affiliate Link) but I really don’t think you need it if you have a good meat tenderizing mallet. 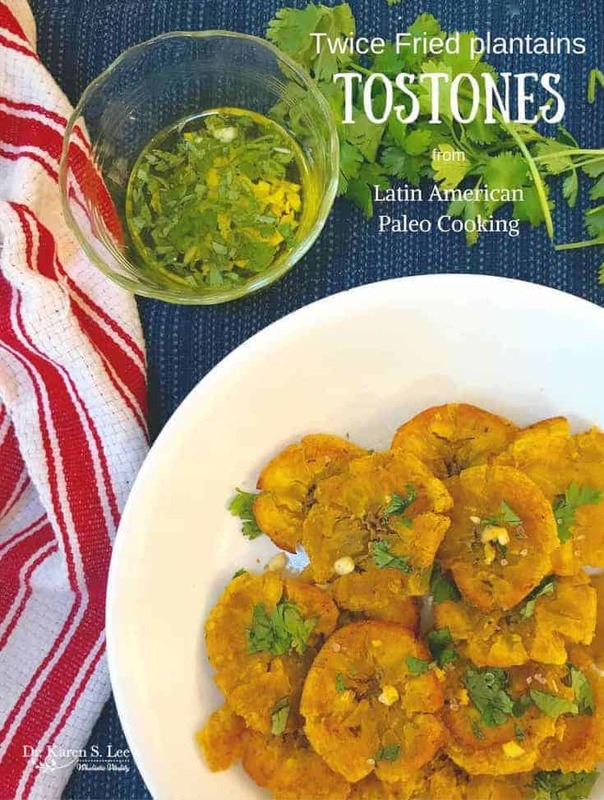 Latin American Paleo Cooking by Amanda Torres (Amazon Affiliate Link) is where I got this recipe from and if you love Spanish food, you have to check out her book. It has some of my favorite childhood foods (sounds strange since I’m not a Latina but I grew up on this food!!) like Pernil (slow roasted fresh ham), Arroz con Pollo (Chicken and Rice), Mofongo (fried plantain stuffed meat), Empanadas, Chuleta (crispy pork chops with garlic), Sancocho (Ox Tail Stew or other meat with Yucca), Chicharrónes (crispy pork belly or skin), Maduros (Ripe Plantains), and many more. 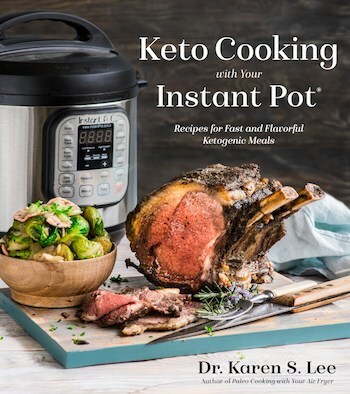 There are over 80 traditional recipes made with gluten and dairy free. They are also Autoimmune Protocol or AIP-friendly or AIP adaptable. I hope you make these Tostones soon. They are truly amazing and addicting. Great side dish but also as a midafternoon snack without the carb load crash. Thanks Amanda for allowing me to share your recipe! Check out her blog The Curious Coconut to get more amazing recipes like this! Tostones are low carb Latin American side dish everyone will love. They are usually deep fried but you can make them in a cast iron (or stainless steel) pan with about an inch of good fat oil like avocado or coconut oil. If you have bacon grease or Lard, they are even better! Slice the tips of the plantains with a knife, then cut 1 or 2 slits in the skin down the length of the plantain. If the peel does not lift off easily you can loosen it by soaking the plantains in a bowl of water with about 1 tbsp of salt for 10 to 15 minutes. Slice the peeled plantain crosswise into disks 3/4 to 1 inch wide. In a large skillet, heat your fat of choice over medium heat until shimmering, 3 to 5 minutes. Carefully add the disks to the heated fat, cooking on each side for 2-4 minutes, or until they have turned a darker, more golden color. Do not allow to brown. Return the flattened plantain disks to the hot oil and fry for an additional 2-3 minutes on each side, or until crispy and browned. You will likely need to work in batches to fry the flattened disks. Add extra cooking fat as needed, because these will absorb quite a bit of fat, as they cook. Top with a sprinkling of coarse sea salt and a garnish of cilantro and serve immediately; tostones do not reheat well. Serve with Mojo de Ajo (recipe below) or with your favorite main dish. Place all the ingredients in a small saucepan and simmer over low heat for about 10 minutes. The olive oil should bubble gently but do not brown (overcook) the garlic. Store in the fridge in an airtight container for up to 7 days.